Rights groups and supporters of alleged WikiLeaks whistleblower Bradley Manning say they're increasingly alarmed that the conditions under which the 22-year-old Army private is being held could amount to torture. Rights advocates, government watchdogs and supporters of alleged WikiLeaks whistleblower Bradley Manning say they're becoming increasingly alarmed that the conditions under which the 22-year-old Army private is being held could amount to torture. In the latest public pronouncements calling attention to Manning's plight, the Psychologists for Social Responsibility this week sent an open letter to Defense Secretary Robert Gates saying it is "deeply concerned" about Manning's confinement conditions at a military prison at Quantico, Va.
"As an organization of psychologists and other mental health professionals, PsySR is aware that solitary confinement can have severely deleterious effects on the psychological well-being of those subjected to it," the group said. "We therefore call for a revision in the conditions of PFC Manning’s incarceration while he awaits trial, based on the exhaustive documentation and research that have determined that solitary confinement is, at the very least, a form of cruel, unusual and inhumane treatment in violation of U.S. law." The letter deplores the "needless brutality" of Manning's conditions and says they undermine his right to a fair trial. "Coercive conditions of detention also increase the likelihood of the prisoner 'cooperating' in order to improve those circumstances, even to the extent of giving false testimony," the letter said. "Thus, such harsh conditions are counter to the interests of justice." A Quantico prison spokesman denied that Manning is being treated unduly harshly. "Pfc. Manning is not being treated any differently than any other maximum-custody detainee in the brig," Lt. Brian Villiard told msnbc.com on Thursday. According to his lawyer, David E. Coombs, Manning has been held in maximum custody under a "prevention of injury" watch at the Marine Corps brig at Quantico since July, when he was charged with disclosing classified U.S. information. The military suspects Manning downloaded and leaked a video purportedly showing U.S. helicopters firing on civilians in Iraq on July 12, 2007. The U.S. military also suspects him of being the source of the leak of hundreds of thousands of diplomatic cables and other government documents to WikiLeaks, though no charges have been filed in that case. Coombs says Manning is confined in a 6-by-12-foot cell with a bed, a drinking fountain and a toilet for about 23 hours a day. On a "typical day," he is awakened at 5 a.m. and is not allowed to sleep between 5 a.m. and 8 p.m.; if he tries to sleep during those hours, guards will make him sit up or stand. He eats all his meals in his cell. He is allowed one hour of "exercise" daily outside his cell, consisting of walking in figure eights in an empty room, according to Coombs. When he goes to sleep, he is required to strip down to his boxer shorts and give his clothing to the guards. He is not allowed to have any personal items in his cell. Coombs has said that Manning's confinement conditions amount to punishment, even though he has yet to go to trial. David House, a 23-year-old MIT researcher who has visited Manning several times at Quantico, contends that because Manning is under a "prevention of injury" watch, he is subjected to conditions "far beyond" other maximum-custody prisoners at the brig. "Over the course of my visits to see Bradley in Quantico, it’s become increasingly clear that the severe, inhumane conditions of his detention are wearing on Manning. The extraordinary restrictions of Manning’s basic rights to sleep, exercise, and communicate under the Prevention of Injury order are unnecessary and should be lifted immediately," House wrote in a recent blog post. The United Nations' top anti-torture envoy, Manfred Nowak, is looking into a complaint that the Army private is being mistreated in custody, his office confirmed late last month. Villiard, the Quantico spokesman, denied that Manning is in "solitary confinement" and said his conditions are no different than the brig's other maximum custody detainees. All detainees at Quantico, like Manning, are either awaiting or undergoing trial. "He lives in his own cell. He’s allowed to converse with other detainees if he chooses to do so," Villiard said, noting that the layout of the brig is such that detainees can hear but can't see each other. "He is treated equally across the board as it relates to other detainees," Villiard said. "It’s a brig. I’m not a qualified person to talk about what is torture and what is not. It’s a military brig and it’s not being run any differently than any other military brig." He said Manning receives "regular visits from both medical and psychological providers" to ensure his well-being. The Washington Times reported Tuesday that the Army is assembling a special board to evaluate Manning's mental state. 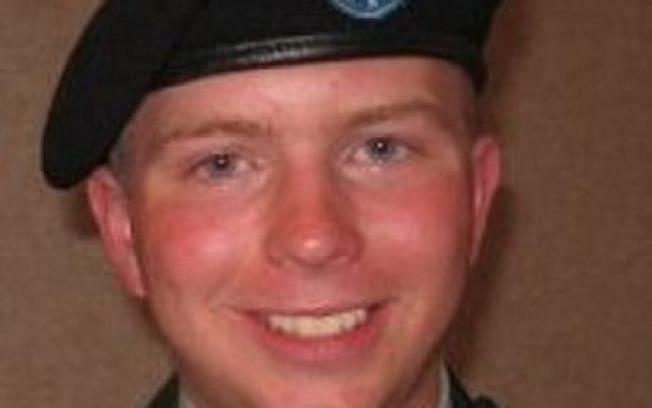 Army spokesman Lt. Col. Robert Manning, no relation to Bradley Manning, told the newspaper that no further legal proceedings will happen until a recommendation is made on his fitness to stand trial. Bradley Manning's supporters and rights advocates have urged citizens to contact Quantico and ask that the restrictions of the "prevention of injury" order be lifted. Villiard said Quantico has received "a good number" of phone calls from concerned citizens about Manning. He said most of them are relieved when base officials explain that Manning is not being treated any differently than other detainees. "There’s nothing going on here that the Marine Corps has any reason to be concerned about and there's no reason for the civilian community to be concerned about, either," Villiard said.